24-Nov-2005 -- This was my eighth target. I parked the car near the T-junction of farm road. The target point was 600 meters SSE away and 120 meters high from here. After 200 meters walk on pavement I walked into mountain path and climbed up a trail to east-side hill. According to my map, there should be a path at the back to the south, but I could not find it, so I walked across the forest about 150 meters. Then I found a pass and followed. I was already almost same height as the target. The pass curved to the left (East) slowly, and closed to the point directly. When my GPS showed 50 meters WNW from the target, I began the final attack. After little fighting in the forest, I easily found the zero point, because the confluence marker was hang at a tree. My GPS also showed the point. It was 9:18JST. 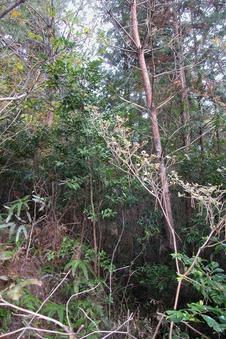 It was in Japanese cedar forest, so no distant view at the point. On the return way, I passed the five paths crossing, south side of a peak, this is only place I could get distant view.